Ah, the art of the toast. No, not the carbs that get crispy under heat. I am referring to the toast that involves alcohol and some kind words in public. It is an art and there are dos and don’ts. We’ve all been witnesses to toasts gone wrong, and not only is it embarrassing for the toaster (whether they know it or not), it’s also horrifying for the toastee. It’s not uncommon to hear the best man ramble on about parties from college or gross childhood pranks. And sometimes there’s the maid of honor who shares inside jokes about high school among sniffles of really uncontrollable emotion. As guests, we feel like we want to steer the train away to safety, but can’t, and instead, that runaway train becomes unstoppable. But toasts don’t have to be roasts! There’s no reason they should become points of embarrassment or a cause to bite off all of your freshly manicured nails! 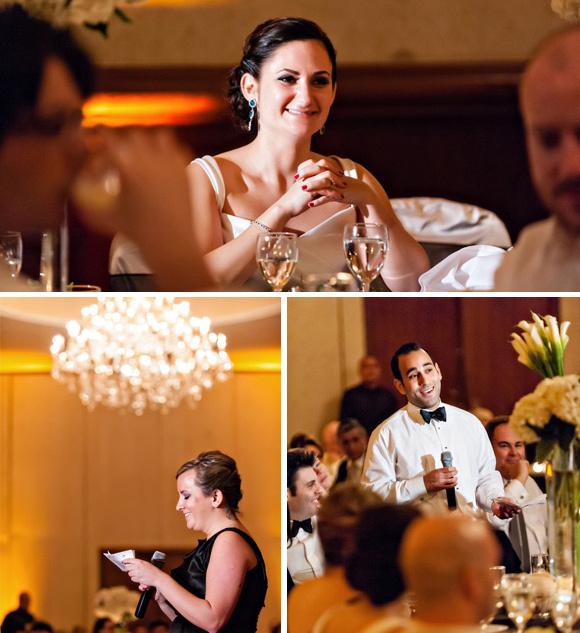 Toasts can be thoughtful, funny, and tasteful, while also endearing, proving why you’ve been selected to speak to and on behalf of the couple. What are the signs of a successful toast? 1. Bring a drink! Don’t guzzle down so much of the drink that you can’t manage to speak, but you also don’t want to propose a toast with an empty hand. It’s easy to forget your bubbly as the M.C. calls your name to the floor and you’re in a flutter of adrenaline, but just keep repeating to yourself: Take a drink. Take a drink. Take a drink. And that way, at the end, you’re not holding up an imaginary glass of Champs! 2. Bring notes with you. You don’t want to memorize anything completely because if you blow a fuse and you forget a point, you’ll lose your entire train of thought and that rough patch will turn into a total meltdown. On the flip side, you don’t want to read your speech word-for-word off your paper. You’ll lose so much of the personable points and it’s almost impossible to not sound like you’re reading. Sounding like Charlie Brown’s teacher should be the exact opposite of your goal. So find the happy medium: Know the points you want to make, but speak about them from your heart. Use your notes as a guide to keep you on track, but speaking freely will keep your words and voice organic. 3. Keep it light and positive! This is not the time to make fun or put down. That’s uncomfortable for everyone! If you’re stuck, find a quote, a movie line, a piece of poetry, a song lyric. They make great intros and closers. You can tell a pretty benign story if it has a reason and a place in the toast or you can offer tips or advice to the couple. And like all fairytales that end in “happily ever after,” you’ll want to end your toast with kind wishes. These tips might help you with crafting a toast, but nothing says it better than this video from a YouTube channel called PODIUM. Check out this short and entertaining clip that’ll give you some professional insight to giving toasts as well as some inspiration as you marinate on ideas of your own. Previous post When Do You Send Thank You Cards for Wedding Gifts?